COLUMBUS (July 11, 2017) - The 2017 USA Diving National Championships will be held at the McCorkle Aquatic Pavilion on the campus of the Ohio State University from July 29-August 12, and the Ohio State Diving Club looks to be well-represented at its home pool. The nationals will bring an estimated 500 divers to Columbus. Twenty-six divers from the Ohio State Diving Club, one of the top diving programs in the country, have qualified for the national championships after the completion of the USA Diving Zone C Championships in Lexington, Kentucky. The top finishers at each of the six zone meets across the country earned a spot into the national championships. The top 10 divers on each springboard event and top seven divers on each platform event at each zone meet qualified for the national championships. The Ohio State Diving Club won the overall team title at the USA Diving Region 5 Championships in April and the overall team title at the USA Diving Zone C Championships in July. Seven Ohio State Diving Club athletes won individual titles at their zone meet, with Grace Basil (11-and-under girls’ 3-meter), Julia Fidanza (14-15 girls’ platform), Jack Matthews (14-15 boys’ 1-meter), Langely Petersen (12-13 girls’ 1-meter), Jordan Rzepka (14-15 boys’ platform), Bailee Sturgill (12-13 girls’ platform) and Maycey Vieta (16-18 girls’ platform), all claiming individual victories. 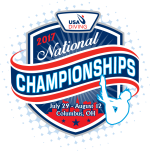 The national championships will determine the U.S. squad for the 2017 Junior Pan American Championships. Noah Duperre and Rzepka along with former Ohio State Diving Club member Cam Thatcher all competed at the 2015 Junior Pan American meet, with Thatcher and Matthews representing the United States at the 2016 FINA Junior World Championships. Advance ticket sales are available now online at a discounted rate. All-session passes for the junior portion of the championships (July 29-August 5) are available online for $50, and all-session passes for the senior events (August 8-12) are available for $30. Single-day tickets are $10 for both junior and senior competition. Children 10 and under are free. Advance tickets can be purchased here. Prices will increase at the door, so fans are encouraged to buy tickets in advance online to take advantage of the discounted rate. The 2017 USA Diving National Championship is the final event of the 2017 Team USA Summer Champions Series, presented by Comcast. The Champions Series showcases numerous Olympic sports throughout the season, highlighting the year-round quest of Team USA athletes to compete at the Olympic Games.